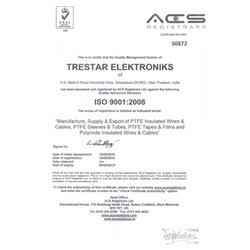 Established in the year 1986, we Trestar Elektroniks, are engaged in manufacturing, trading, exporting and supplying a wide range of PTFE Insulated Equipment. Our range include PTFE Hook-up Wires & Insulated Equipment Wires, PTFE Multicore Cables, PTFE Sleeves & Tubes, PTFE RF Coaxial Cables, Double Shielded Cables, PTFE Double Shielded Cables & Triaxial Cables, PTFE High Voltage Corona Resistance Wires and PTFE Thermocouple Wires. Located at Ghaziabad, Uttar Pradesh, we are led by our mentor Mr. Brij Bhushan, His visionary approach and dedicated support of our dedicated team allows us to successfully meet our operation goals. Furthermore, we follow transparent business policies, which helps in offering complete range of products, which meets the specific requirements at client's end. In addition, the competitive prices of our products has also helped us to make many quality conscious clients in the global markets and cater sectors like defense, telecom, aerospace and instrumentation industries. We are also exporting our products in Europe, Singapore, Japan, North East etc. We are committed towards offering qualitative range of PTFE based electrical parts to our customers. All products are manufactured as per ISO 9001:2008 quality standards and 100% tested as per relevant specifications in fully equipped laboratory. Further, we use silver plating and nickel plating lines and can also offer plated conductors confirming to ASTM specifications. We have with us services of experienced and dedicated team for manufacturing a wide range of PTFE multicore cables, PTFE sleeves & tubes, PTFE RF coaxial cables and others. Our team comprises of production floor manager, quality checking inspectors and other support staff for smoothly carrying out the production procedures. To maintain the quality standard and meet the business targets, each of the team members work in complete coordination with each other. Moreover, all our team members are well versed with on going technological advancements, which helps them to deliver the final products as per the specifications and requirements of our customers. PTEF is a synthetic fluoropolymer, which are flame resistant and have unique adhesion quality. It is used as a non-stick coating for pans and other cookware. Further, PTFE is non-reactive and so suitable for usage in containers and pipework for reactive and corrosive chemicals. Also used to coat varied types of hardened, armor-piercing bullets, which helps to reduce the amount of wear on the firearm's rifling.